Will Arsenal finally sign a defensive midfielder? Will Chelsea swap some wingers around? And at the bottom of the table, who will land a striker to help beat the drop? It is time to find out as the January transfer window closes on Monday, 2 February - at 23:00 GMT in England and midnight in Scotland. The window has been relatively quiet so far but football clubs often end up leaving their shopping until the last minute. Whether it is a new goalkeeper for Hartlepool or four new strikers for Harry Redknapp, you will not miss a deal with BBC Sport. Follow our live text commentary from 07:00 GMT on your computer, tablet or phone via the BBC Sport website or app all the way through to the bitter end. We will bring you the latest news, views, speculation and done deals from our reporters around the country and worldwide, while you have the chance to interact and get involved. Our transfers page captures every move, while each club page will be updated with the latest transfer stories concerning that club. Will Wilfried Bony's £28m move to Manchester City remain the biggest deal of the window? As well as deals in the Premier League, Football League and Scottish Premiership, we will also be tracking the big moves in Europe and beyond, including the main ins and outs in Spain's La Liga, Italy's Serie A, Germany's Bundesliga and France's Ligue 1. We will also be holding votes throughout the day on our live text page to capture your views of the day's movers and shakers. We will also bring you regular online video updates from BBC pundits, with Trevor Sinclair, Kevin Kilbane, Danny Murphy, Phil Neville and Jermaine Jenas offering their views on the big stories as they happen. 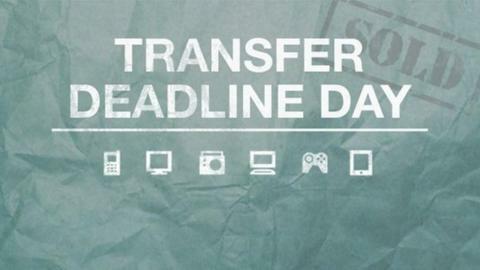 You will be able to follow all the deadline-day deals via the @BBCSport account on Twitter and share your views using #bbcdeadlineday. There will also be updates throughout the day - as well as the opportunity to give your reaction - on our Facebook and Google+ pages. Our reporters across the country will also be sharing their photos from behind the scenes on the BBC's Instagram page. There will be regular transfer updates on the BBC's national and regional radio stations. Chapman will be joined in the studio by former England internationals Murphy, Neville and Jenas, with QPR midfielder Joey Barton also giving his views. The BBC's World Service will be tracking the big deals from around the globe, with reporters across the big leagues in Europe, in South America and at the Africa Cup of Nations. The Sport Today radio programme at 15:30 GMT will be focusing on the latest deals. See in the deadline with Dan Walker, who will present a transfer deadline day special edition of Football Focus on BBC One from 22:45 GMT. He will be joined by Murphy, Jenas and Neville to round up the day's events, as well as an overview of the whole transfer window. There will be regular transfer news on national and regional television programmes as well as BBC World, while you can watch the BBC Radio 5 live special from 19:00 GMT on the BBC red button. The News Channel will broadcast a 30-minute transfer deadline day edition of Football Focus at 18:30 GMT, presented by Walker, that will also be streamed on the BBC Sport website. Guests will include Jenas and Kilbane. BBC World News will have bulletins at 18:43, 20:43 and 23:43 GMT. You can read the latest news, listen to 5 live and watch the TV coverage via the BBC Sport app on your smartphone or tablet. It is available from Google Play for Android devices, the App Store for Apple devices, and the UK Amazon Kindle Fire Appstore.